Recently U.S. toy manufacturer K’NEX had an opportunity to show the value of CDF. K’NEX Brands is a family-owned construction toy company located in Hatfield, Pennsylvania, just outside of Philadelphia. Since 2009, K’NEX has re-shored most of its toy construction from China to Pennsylvania, and now manufactures 90 percent of its own parts and 80 percent of its finished products in the United States. This re-shoring resulted in cost savings associated with inventory, forecast accuracy, and timing of almost 20 percent. Suppose the cost of producing in China is 100 (as illustrated in the figure). The inventory costs required to offset the risk of running out of product (called “timing and forecast” in the figure), accounted for costs equal to 39 in China but only 26 in the United States. The reason the savings were so large is that when the product was coming from China, K’NEX had to guess up to 22 weeks ahead what its customers might demand. Not wanting to risk losing a sale, K’NEX ordered a lot of extra product that might not ever be sold. Now, K’NEX can wait to commit production until it has full knowledge of demand. 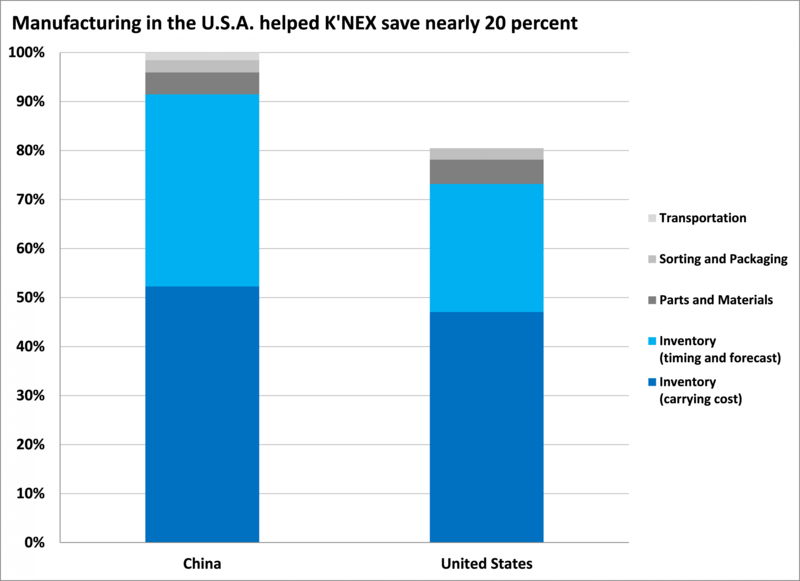 The K’NEX story highlights the high inventory costs dictated by offshore manufacturing and long lead times. Bringing together the mathematically rigorous insights of the CDF tool and the real-world experiences of K’NEX helps us understand just how large these costs can be, and the potentially huge savings resulting from reshoring. The CDF was developed by Professors Suzanne de Treville and Norman Schürhoff of the University of Lausanne, and has been tested by Professor de Treville and her laboratory in a variety of multinational companies. Professor de Treville served as a visiting professor at MIT during the spring of 2014, during which time she worked intensively with the Department of Commerce to make the CDF available through Acetool.